Tribute also made to six "adopted" sailors from unknown hometowns. 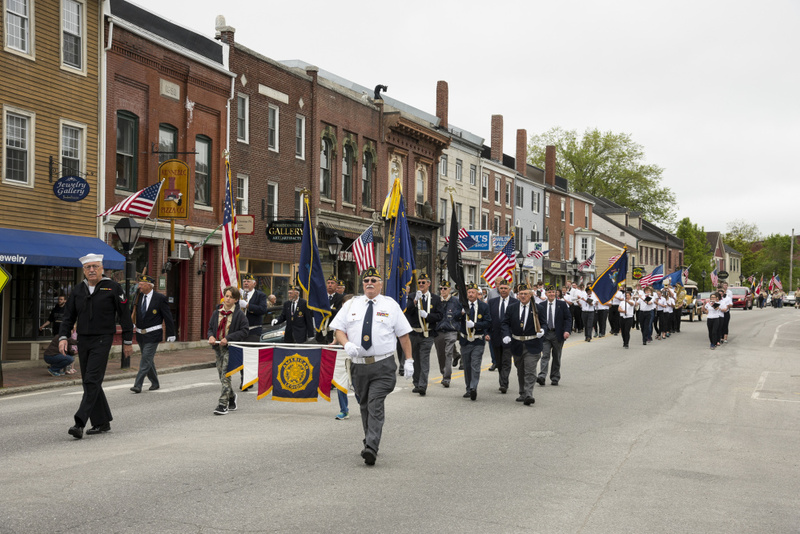 Photo by Elise Klysa Members of the Goodrich-Caldwell American Legion Post 6 march down Water Street in downtown Hallowell during the annual Memorial Day Parade on Monday. 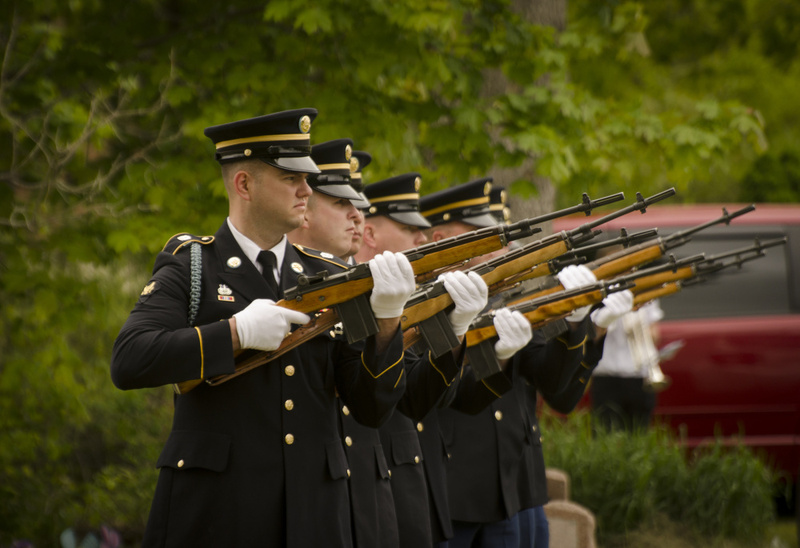 HALLOWELL — About 150 people came out to honor the sons and daughters of Hallowell who died at war, as well as six others, whose hometowns are unknown, who were “adopted” by the local legion post. 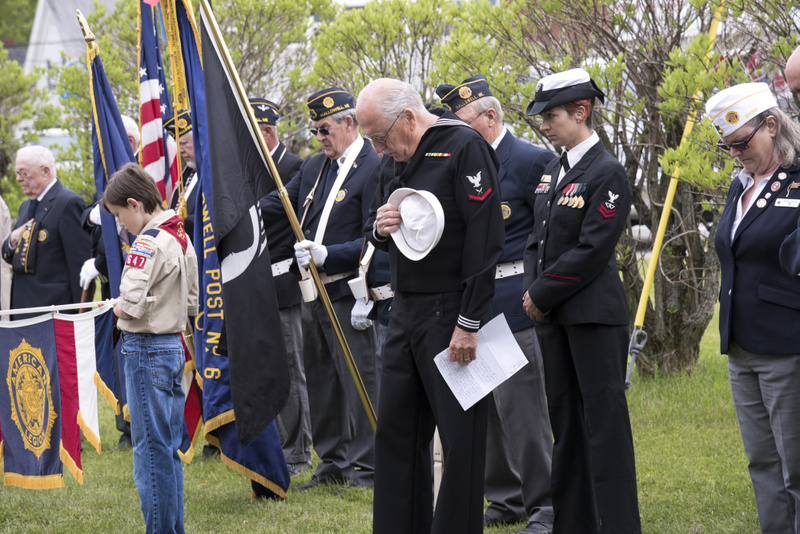 Solemn Memorial Day ceremonies took place at the Civil War Monument and Veterans’ Park in Hallowell Cemetery, as well as beside the Kennebec River on the small city’s boardwalk. A wreath was tossed into the river in memory of those lost at sea, including six of the 266 U.S. sailors killed on board the USS Maine when it blew up in 1898 in Havana Harbor, and who were never claimed by their hometowns. 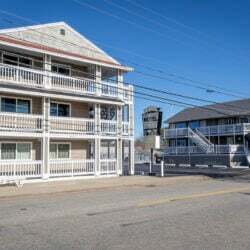 Goodrich-Caldwell American Legion Post 6 member Steve Mairs said the names of the six sailors are known, but for whatever reason, it is not known what town, city or state they were from. 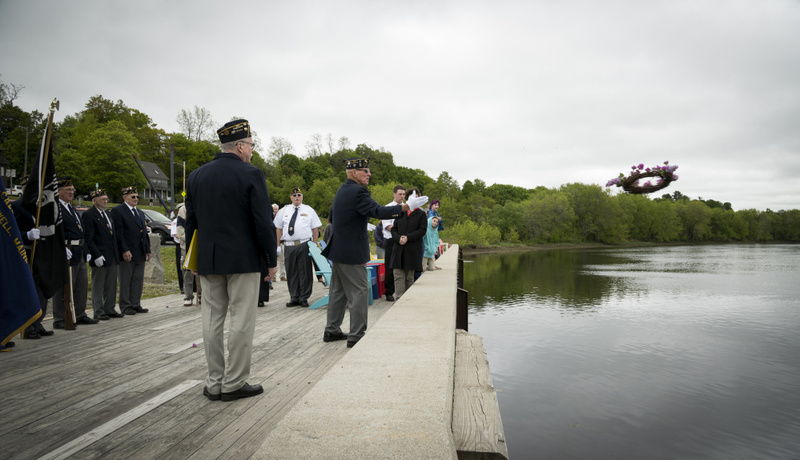 “So this legion post, here in Hallowell, Maine, adopted those six souls,” Mairs said, before Marine Corps veteran Ernie McPherson tossed a wreath made of vine and lilac flowers weaved together into the water. Earlier, at Veterans’ Park, after the Hall-Dale High School band played “God of our Fathers,” local comedian and Vietnam veteran Gary Crocker, in his Navy uniform, spoke emotionally about the sacrifices made at war. 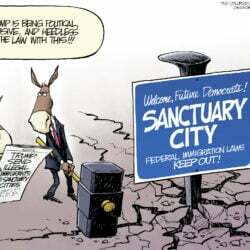 He recounted an incident in the late 1960s when he was on rest and relaxation from the war in the Philippines, sitting around a table with other troops when someone asked where they served. Crocker and two others answered they served on the USS Boston. 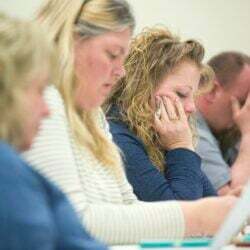 His voice breaking, Crocker said he shared that story because it means so much to troops that their brothers came home, and a reminder that so many didn’t. Wreaths were laid at both the Civil War Monument, which lists Hallowell residents who died in that war, and the Veterans’ Park at the opposite end of the cemetery, which lists all soldiers from Hallowell, living and deceased. 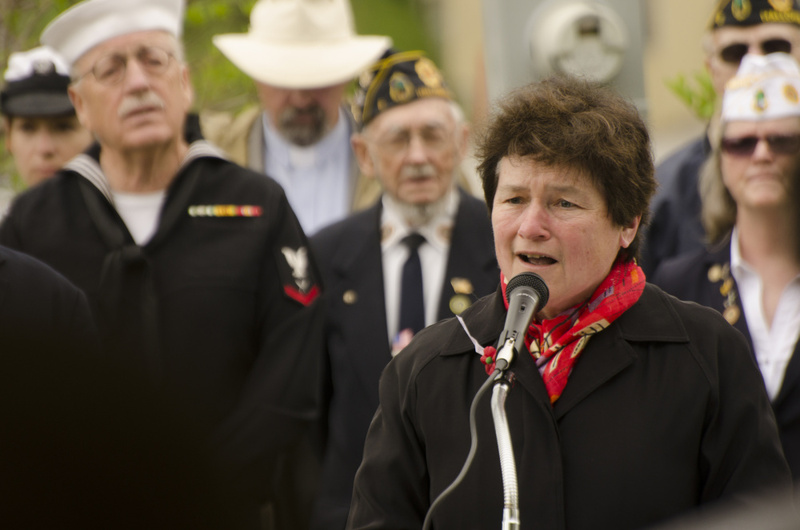 Rabbi Erica Asch, in the benediction at Veterans’ Park, reminded attendees that each of the names on those lists was an individual person, not just a number. 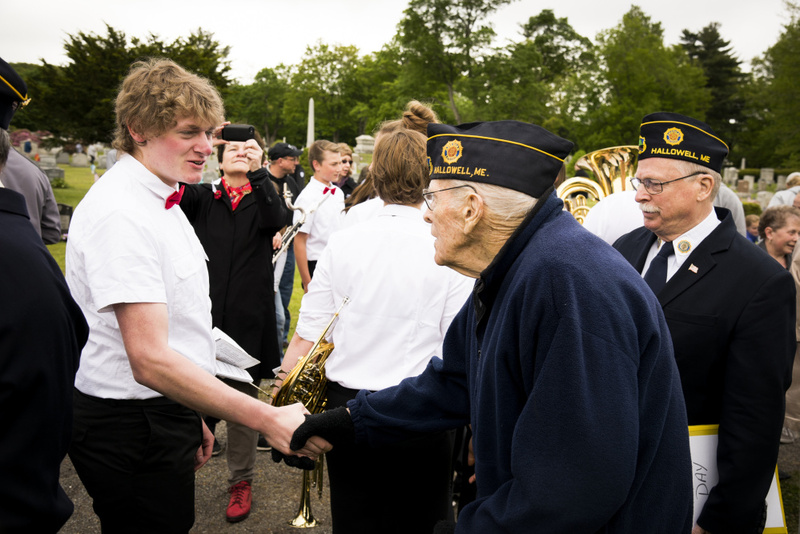 The Hall-Dale High School band played several numbers, both during the short parade to the site and in the cemetery, including “You’re a Grand Old Flag,” “America the Beautiful,” “Battle Hymn of the Republic,” and the national anthem. Joan Morgan and Jean and Don Davenport played and sang “When Johnny Comes Marching Home” at the Civil War Monument, and Nancy McGinnis sang “God Bless America” at Veterans’ Park. “Seeing everybody here today reflects the heart and soul of our community and how much we care to honor the people who have died in service to our country,” said City Councilor George Lapointe. 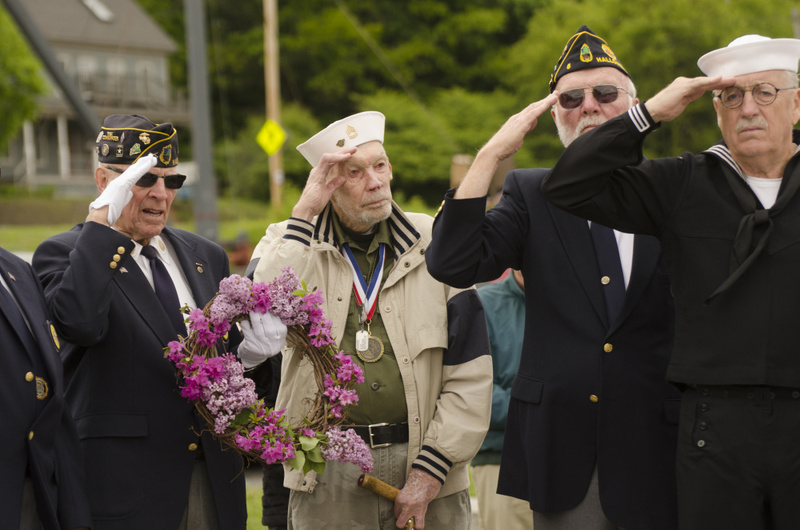 Hallowell’s Memorial Day observances were among several in the central Maine area Monday.